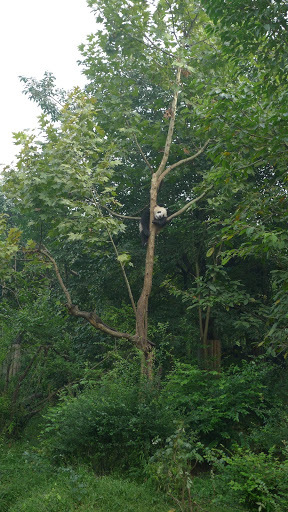 I’ve never been a huge fan of visiting animals in captivity and the Chengdu Panda Breeding Center wasn’t up there on my list of “must do” things in China. 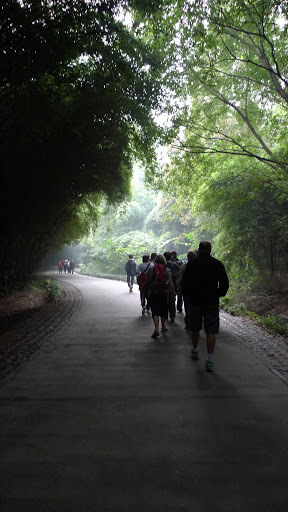 But it turned out to be one of the highlights of the whole China trip! Absolutely loved being with these very beautiful creatures. How could you not fall in love with their gorgeous black eyes and big fat furry bodies? The animals are really well cared for and they all seemed happy and healthy. 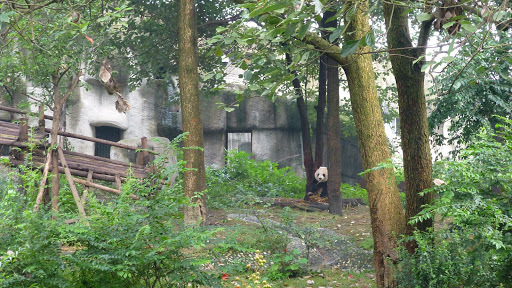 We arrived early (8.30am) so we were able to catch the pandas as they were waking up and coming out for breakfast. They were referred to as “sub-adults”, which I think is a good description of teenagers! They just lay about eating and making a huge mess of their bamboo shoots. 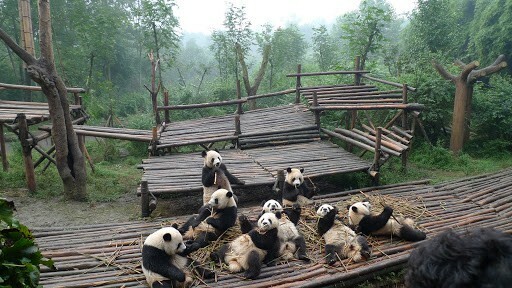 The center is run by a not for profit organisation, started in 1987 with 6 rescued pandas. The Giant Pandas are in danger of becoming extinct because there’s not enough bamboo growing to sustain them. 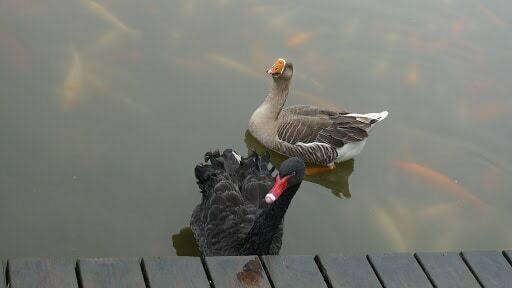 Plus apparently they’re not particularly good at doing the breeding thing. It turns out they are too lazy and can’t be bothered. 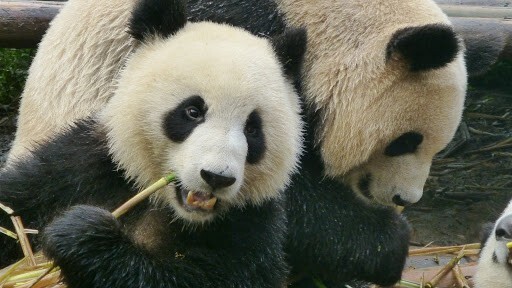 Giant Pandas have been around for over 2 million years and there are only around 1500 left in the world. We took a peek into the nursery and were lucky enough to see tiny babies in incubators. Too cute. Check out this video. The crowds didn’t start to turn up until we were leaving, so we had plenty of space and time to move around and enjoy the place. 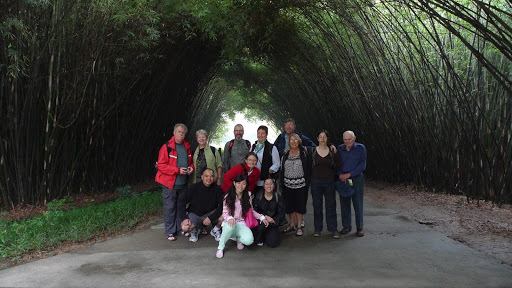 Beautiful bamboo forests and lakes with all sorts of birdlife make up this huge park. 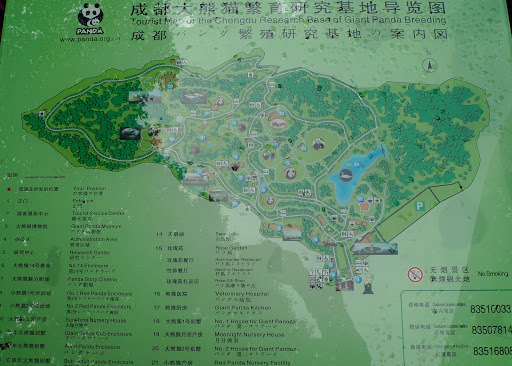 A very beautiful serene place where the Pandas live. They didn’t want to show their faces. 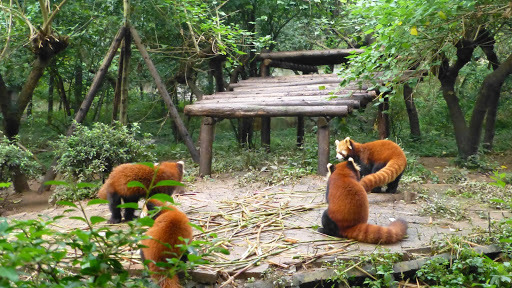 There was an area just for Red Pandas and they were very unsociable, turning their backs to us while they munched away so we couldn’t really see their pretty red and white faces. 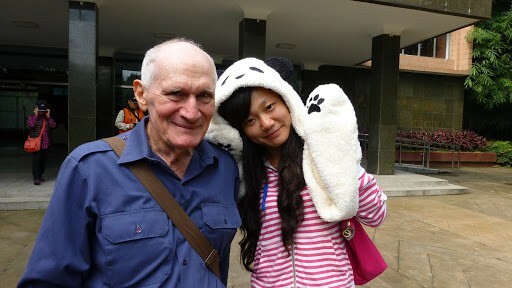 Jing trying out her new Panda winter warmers. 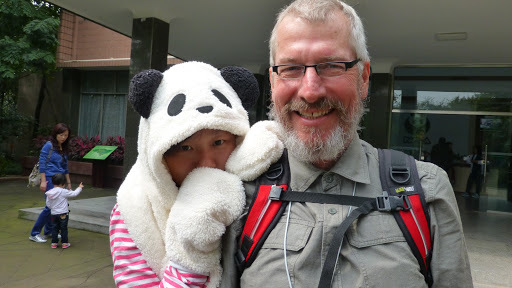 So after a fantastic experience with the pandas, we headed back to our hotel for a very short pit stop before heading off on a short walk to the restaurant for a Sichuan hot pot meal. Now that was something we were really looking forward to. We’d heard a lot of great things about the mouth-numbing Sichuan food so we knew we were in for a treat….. come back soon to find out.